Ballsy Hunt set to reject approach from Murdoch! 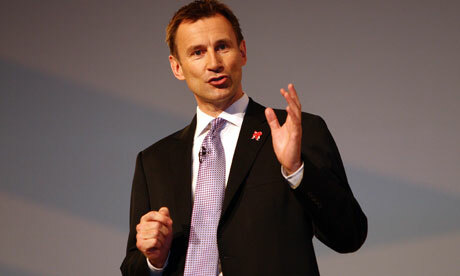 Culture secretary Jeremy Hunt is expected to refer the News Corporation bid for BSkyB to the Competition Commission. Photograph: David Jones/PACulture secretary Jeremy Hunt is expected to refuse any requests byRupert Murdoch‘s News Corporation to meet or communicate with him directly as he weighs up whether to hold up the company’s controversial £8bn buyout of satellite broadcaster BSkyB. So sensitive is the case that Hunt, his civil servants and advisers are expected to rebuff any external lobbying – so they can base their judgement only on a analysis of the public interest issues raised by the proposed deal that was completed by media regulator Ofcom today. News Corporation, which assiduously wooed Hunt’s Conservative Party before the election, wants to meet with the minister or at least send him a dossier of information to help him make his final decision. However, the company had not been given any assurance that it would be able to do so. Ofcom spent New Year’s Eve completing its report – which is expected to recommend a further, six month long enquiry by the Competition Commission. Hunt will have about 10 working days to decide how to proceed, and will publish both the report and his verdict in the middle of January. Hunt’s team are determined not to trip up in what they describe as an “awfully difficult case” after watching business secretary, Vince Cable, being stripped of his powers to regulate the media industry in the wake of his unguarded “war on Murdoch” comments made to two undercover journalists from the Daily Telegraph. The Conservative cabinet minister has complete discretion as to whether to follow Ofcom’s advice or not, leaving him the choice of clearing the proposed deal or referring it to the Competition Commission. However, it will be a major surprise if he does not follow the regulator’s advice in a quasi-judicial process that means that he is not supposed to discuss the matter or take any guidance from David Cameron or other members of the coalition government. At issue is whether News Corporation’s buyout of BSkyB would lead to the creation of a media company that with £7.5bn of UK turnover is so large that rival newspapers and broadcasters are progressively unable to compete. Objectors to the deal include an unlikely alliance of the owners of the Daily Mail, the Mirror, the Daily Telegraph and the Guardian, who argue that the tie-up would lead to a loss of “media plurality” in the UK. Ofcom has been trying to quantify Rupert Murdoch’s media power, asking media analysts as to how it might be possible to measure how far the combined News Corp and Sky would dominate news attention. Chris Goodall, from Enders Analysis, was among those asked to suggest methodologies that the regulator could use. Previous 2010: The Year of Islamophobia! Next Naughty Hackers target Mugabe!